Where are our powers if there is a Child Protection Plan or a Child In Need Plan? We work with these families on a daily basis. 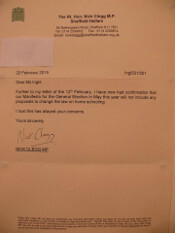 This entry was posted in Uncategorized and tagged AEHEP, Association Elective Home Education Professionals, Child in Need, Child Protection Plan, Daniel Monk, Donaldson, faith schools, Graham Stuart, Ofsted, Phillips vs Brown, Stephen Bishop on February 27, 2015 by Fiona Nicholson. What Would Lib Dems Do About Home Education? This entry was posted in Uncategorized and tagged Coalition, Constituency MP, General Election, LibDems, Manifesto, Nick Clegg, tuition fees on February 25, 2015 by Fiona Nicholson. Does Barry Sheerman Speak Hungarian? I recently went to a talk at the Institute of Education given by Barry Sheerman, the former Chair of the Children Schools and Families Select Committee. During his talk, which ranged over a wide variety of topics including career advice, autism, cuts at Kirklees Council, faith groups, banter with the formerly home educated Caitlin Moran, the Trojan Horse inquiry in Birmingham, scruffy back rooms and so on, Barry told us he’d met a Hungarian lady recently who had 2 children she was going to home educate. This entry was posted in Uncategorized and tagged Barry Sheerman, Birmingham, Caitlin Moran, election, Hungarian, Institute of Education, Kirklees, Labour, middle class, numbers, scruffy back rooms, Trojan Horse on February 20, 2015 by Fiona Nicholson.